Disclaimer: The follow is a work of fiction for the purposes of the July/August 2007 One Week Challenge on simplyscripts.com. This is a fictitious email to set the theme and genre of the one week challenge. In no way should any infer from this email that the script submitted will be produced or made into a movie. Subject:	I need a script. It needs to be a Thriller (It can be a thriller in the broadest sense of the word, so I’m open to crime stories, supernatural/noir/scifi/comedic/romcom elements. But, it has got to be a Thriller. I need to be thrilled. Also, very important, below find a picture of the set. I got a boat. The boat floats and can be moved. Best yet, we can do anything we want to the boat. Anything . As you know, a magnesium flare went off in my face a few weeks ago. I can’t see anything. I haven’t seen the boat, yet, so I’m going to have to rely on the script to give me an idea of what I’m dealing with. I’ve asked iScript.com to record the script you select. 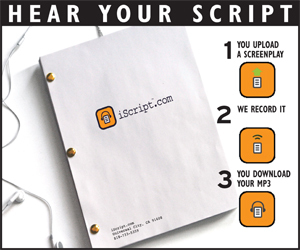 As you know, iScript.com Lets You “Hear Your Script.” They turn scripts into mp3s! You upload a script – they record it using professional readers and picky sound editors – you download your iScript! Burn CDs, listen on your iPod, submit it to execs, producers, agents. Now people can hear your script while driving, jogging or relaxing. . There you have it folks. Write a 15 page or less script (in proper screenplay format). 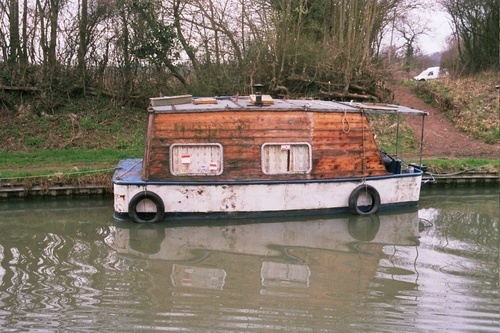 It has to be a thriller and has to incorporate the boat. Please submit your scripts no later than Saturday, 11:59 pm August 4th, 2007. This is a free contest and as a result, you have no chance of winning anything at all. One script will be selected to be performed by iScript.com. If you are ready, submit your script here. If you need clarification or just want to talk about the topic, visit the Discussion Board. It is free to sign up. Further clarificiaton: This is a free challenge. There is NO cost to enter. There are NO prizes. Your script will NOT be produced. You will get NOTHING out of this challenge other than a warm feeling in your stomach that you have participated. iScript.com has agreed to audio produce one (1) script of my choosing. Thanks to Leon (formerly of Leon’s Script Collection and Daily Script we can enjoy not only Airplane! but the dismal Airplane II: The Sequel (which the masterminds to Airplane! Jerry Zucker, David Zucker & Jim Abrahams refused to watch). You can skip on over to the Movie Scripts page. On the Unproduced scripts page there are 23 or so new/revised scripts up for your reading pleasure. Speaking of unproduced scripts, with the help of iScript.com we are coming ever closer to the release of the theme this month’s One Week Challenge. Voting is still open as to the genre. Thriller is in the lead, but it is still early. You have until Saturday to cast your vote. This Saturday, July 28th, the genre and theme for the one week challenge will be announced. For those of you unfamiliar with the One Week Challenge, it’s an ‘unofficial contest’ to see how well you work under pressure. Imagine of a director came up to you and asked you to write a short script based upon an idea that he/she has and you have one week to write it. Could you do it? Come around Saturday to find out the genre and theme and see if you are up to it. You have one week to write a fifteen page (or less) script based on the genre & theme announced. The script MUST be in a generally accepted screenplay format. Do not put your name on the script. For the first week or so, the scripts will not have the writers’ name on it so no one can pick favorites. Submissions posted to the site – starting 8/5 through 8/11 without names. One script will be selected by some as yet to be determined criteria (either I pick, I get a screenwriter to pick or some kind of voting) and it will be recorded (assuming the writer gives permission to have his work recorded and posted to the site for a month) on MP3 by the fine folks at iScript.com. Thanks to Ron and the two anonymous individuals for their kind and generous donation to SimplyScripts. Shout out to John and Renee, two scriptarians who attended the Harry Potter party at the Whistlestop Bookshop friday night. For those hunting around for the lost Lost scripts (not transcripts) those can now be found here. Updated the TV Scripts and Transcripts database where in you will find, among other things the first episode of season three of Dr. Who – Smith and Jones. This comes from BBC’s Writer’s Room which also has teleplays of episodes of Life on Mars, Casualty and Hustle. Find also on the TV Scripts page, thanks to Weekly Script, episode 2 of Deadwood and, thanks to TimMinear[dot]net, you can read the last to episodes of Drive. (You can also watch the last two episodes of Drive on the Fox Myspace page. Thanks to Mama Cass (I’m pretty sure it isn’t theMama Cass) and Daily Script read this draft of Wind Chill. This would be on the movie scripts page. On the Unproduced Scripts page we have 16 new or revised scripts up for your reading pleasure. Movie Set has a number of movies in various stages of production. One of them is Blood: A Butcher’s Tale. Aaron Douglas (of Battlestar Galactica fame) plays Sam, a butcher who discovers that the love of his life is being seduced by a vampire. He then sets out to butcher (literally) the entire race of vampires. There is a lot of information about the movie (including the script) over on Movie Set.com. You can also read the script over on the movie scripts page. Happy Canada Day! Or, as we call it here in the U. S. and A. – Sunday. … young Daedelus Murphy and his ragtag band of friends and rivals are about to learn that that curiosity can be the most dangerous crime of all.. This was written by by Holly Gramazio and Brendan Adkins. The script is available in html and pdf format. Also, you can listen to a live reading in mp3 and ogg formats. Check it out on Xorfph.com. Found via Da Vinci Automata – Thanks Sci Fi Scripts for the heads up. Entries (RSS) and Comments (RSS) | 63 queries. 0.203 seconds.